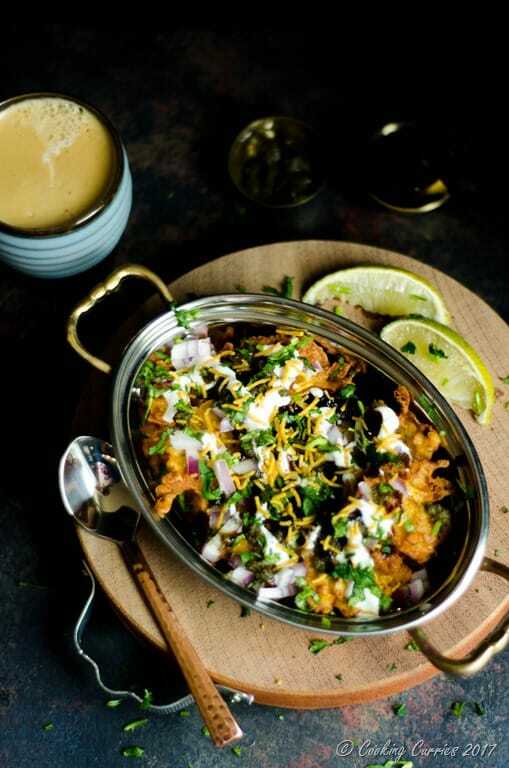 This Pakora chaat is a quick tea time snack with onion pakoras / onion fritters as the base and an assortment of chutneys and other accompaniments on top! Honestly, I have never had a pakoda chaat before and never heard of it even. I had some leftover pakoras from making some for Kadhi Pakoda and I wanted to do something else with them than the usual just pakoras for tea time. I figured that they could be a base for a pakoda chaat just like papdis (fried wafers) or samosas in a papdi chaat or samosa chaat. I searched around on the interwebs and found that there is in fact a thing called pakora chaat but it is palak pakora chaat – with pakodas made with spinach and not really any onions pakoda chaat. But that did not really stop me from taking the plunge and I am glad I did, because we thoroughly loved this different snack with our chai. 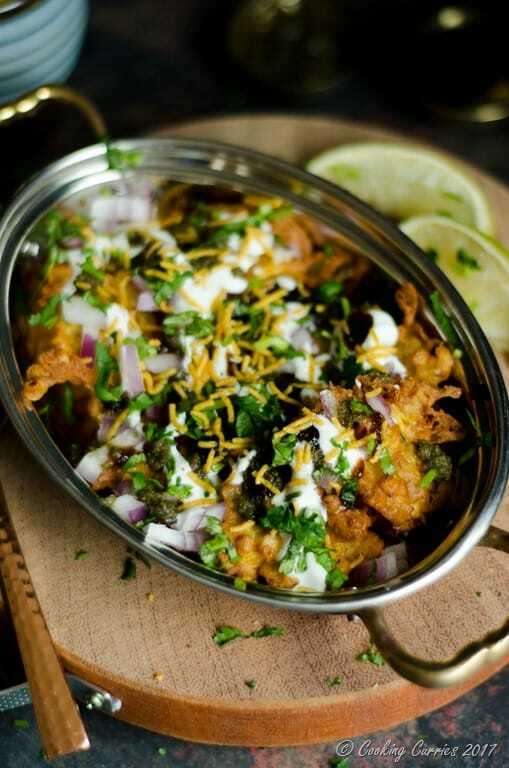 The trick in making a good pakora chaat is to assemble it right before serving or else the pakoras would get soggy and that wont be real nice. You still want the crispiness of the pakoras as the chutneys slowly start to work their way to them, but by then you will have worked your way through it. You can mix and match chutneys and toppings as per individual taste and can even let everyone make their own plate by just keeping all the assortments set up. Go ahead! Make them, you will love it! Mix all the ingredients together with a little water till the besan is mixed well. Add more water to make a batter slightly thicker than a pancake batter. Heat oil in a pan, drop a little of the batter to see if the oil is hot enough. If the batter rises up almost immediately, the oil is hot. Add a tablespoon of batter each to make pakoras. Flip them over after a minute or so. Fry till both sides are golden brown. Drain on paper towels and keep aside. Place 3-4 pakoras on a plate. Pour chutneys and yogurt over the pakoras. Start with a couple of teaspoons each of the chutneys and yogurt. You can always add more if you need. Sprinkle some of the chopped onions, the minced cilantro, the sev and some chaat masala. Enjoy with a cup of chai. 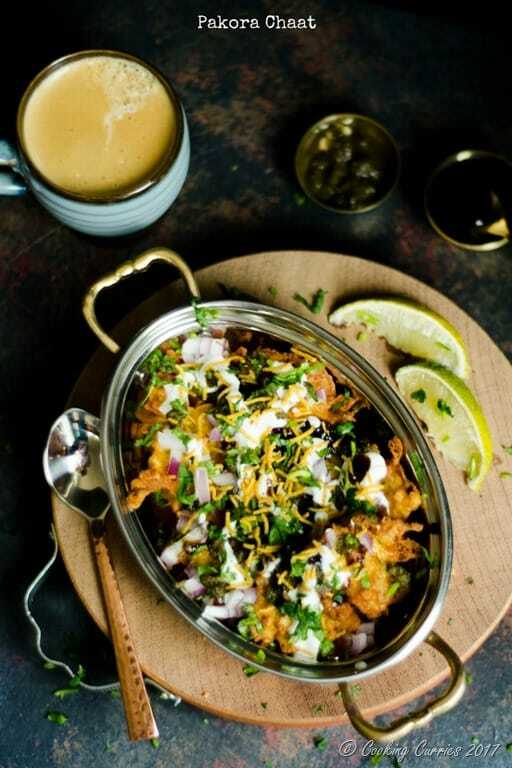 This Pakoda chaat is a quick tea time snack with onion pakoras / onion fritters as the base and an assortment of chutneys and other accompaniments on top! 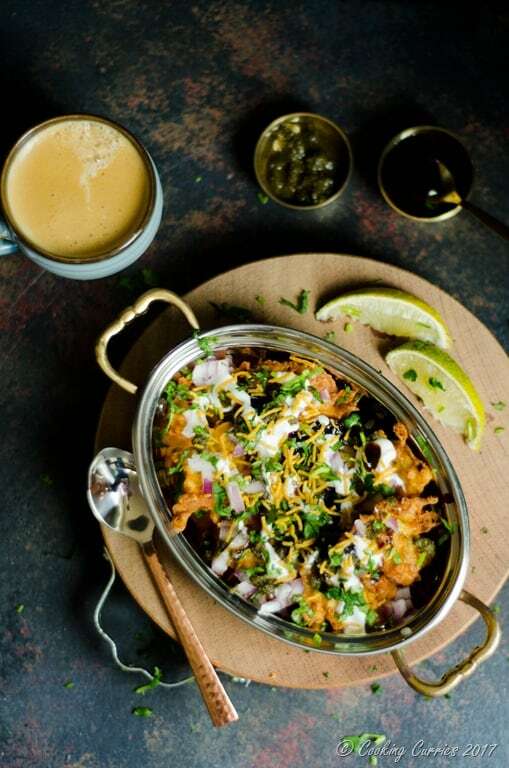 I have never heard of pakora chaat but this looks PHENOM! I visited India a few years ago and all of the chaats were on the top of my list of favorites. I’m definitely going to give this one a try. Thanks so much for sharing! I’m in love with South Asian food and anything with spice! This looks so tasty and delicious! I wasn’t thinking about food until I saw this! Love Indian food but as an American, we are not exposed to, too many different dishes. This looks like a wonderful vegetarian recipe that I certainly have not seen.